Whether the requirement is for a single standalone access control door or a PC based system Mere (UK) will design and install a system to meet your needs. Switch2 is a single door control unit. The control unit stores the access permissions of the user and is mounted within the building. This makes the system suitable for high security applications. Switch2 can be used with PROXIMITY, CARDLOCK or TOUCHLOCK readers. 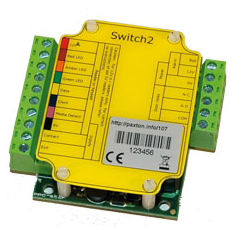 Switch2 can be installed to many doors over a site, all using the same tokens. Two readers can be connected to a single unit to give read in and read out access control. The operation of Switch2 depends on the mode. PROXIMITY and CARDLOCK. User tokens are valid and ready for use once installation is complete. Every user token is supplied with a corresponding shadow card. As user tokens are issued, the name of the user is marked on the shadow card. If a user is to be barred, or a user token is lost, the shadow card marked with the users’ name is presented to all readers on site. This simple action invalidates the user token. Another user token may be issued for that user. Additional features can be programmed using the PROXIMITY or CARDLOCK function card pack. These features include zoning which allows you to limit access by token colour. TOUCHLOCK If a valid code is entered access is granted. Codes are changed via the keypad using the master code. PROXIMITY KP keypad. Choose card + code, card + PIN, card only or code only. Net2 is a networked access control system. A networked system gives the advantages of central control, event reporting and flexible control over users’ access. Each control unit is part of a network but can run independently making its own decisions and remembering events. The Net2 plus control unit connects to the central administration PC using an RJ45 plug into a standard TCP/IP Ethernet network. This greatly increases the flexibility of installation options on sites that have LAN/WAN networks. The Net2 plus control unit also has a RS485 connection. This means it can be connected to other Net2 plus or Net2 classic control units using a dedicated CAT5 cable. One Net2 plus control unit can be the network interface to the LAN and also run a wired RS485 daisy chain of other Net2 plus or Net2 classic units, removing the need for an independent TCP/IP to RS485 converter. Net2 plus is also available with a Power over Ethernet (PoE) power supply. PoE is a technology that allows both power and data to be passed along Ethernet cabling. Net2 plus with PoE simply plugs straight into the existing LAN using a standard RJ45 plug (providing it is powered by either a compatible PoE switch or a PoE injector). 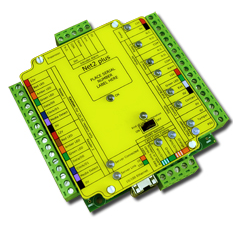 Control units are sold as a PCB only, within a plastic housing or mounted within a 2A boxed metal/plastic mains monitored backup power supply. The Net2 plus unit now comes with PoE+ power supply in metal/plastic cabinet; no separate mains supply back-up required. Any changes made at the PC are immediately communicated and stored at the control unit. When a user presents their token to the reader, the control unit identifies them and permits or denies access as appropriate. Net2 Entry is a door entry system that works standalone or alongside Paxton’s Net2 access control, combining door entry with key features of Net2. Net2 Entry comes in a discreet design that is suitable for a range of environments. The Net2 Entry panel has an attractive brushed steel effect for a smart appearance and durability. The panel can be mounted onto a metal surface if required. A visitor initiates a video call via the bell button on the external panel. Visitor access can be granted via the Net2 Entry monitor, which features an intuitive touchscreen user interface. 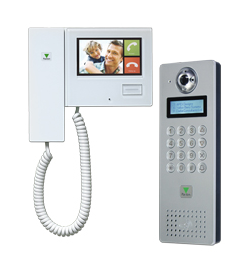 The internal monitor can be used via either the handset for private calls or in hands free mode. When connected to Net2, access to the building can be gained by using a PIN, Code and/or proximity token. For more information on what Mere UK have to offer or to arrange a site visit call us on 01744 750269 or Email is via our contact form by clicking the button opposite. Registered in England and Wales no. 7270271. Registered office: Peter Street Centre, Peter Street, St. Helens, Merseyside, WA10 2EQ.